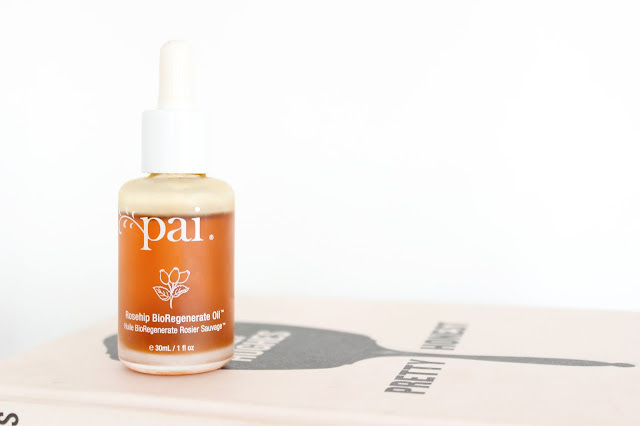 Pai Rosehip Bioregenerate Oil, is a facial oil worth talking about. And it's not often we talk about skincare here around these parts! Beauty obsessives love this oil from Pai. Why? Because it works. I don't share skincare all that often here on BBA purely because I don't like to swap and change up my skincare routine all that often. But the Pai Rosehip Bioregenerate Oil is a product I rely on to sort my skin. Admittedly I don't use this oil on a daily basis (maybe I should? ), but when my skin has a temper tantrum, I get plagued with pesky red bumps and redness and in turn scarring. And the Pai Rosehip Bioregenerate Oil helps with a multitude of skin concerns, but most importantly it's a healer. The orange-coloured oil (won't leave you looking like a human tangerine) but is infused with unique concentrated blend organic and natural ingredients including; rosehip fruit and seed oil and Omegas 3, 6, 7 & 9 (essentially fatty acids). Combined, the ingredients in Pai's Rosehip Bioregenerate Oil boosts the skins natural healing functions, whilst helping to protect and maintain moisture, softness and elasticity of the skin. This oil can be applied at any time of day, but I tend to use it alone before bed. Using the glass dropper, I apply 2-3 drops into my palms and massage the oil onto my freshly cleansed face. On application, the oil improves my skin's texture almost immediately, plumping it up whilst reducing redness and blurring fine lines. After just a few uses the discolouration that's left after pesky blemishes come to stay is significantly reduced and my skin is calmer in colour and brighter in appearance and generally in a much better condition. Overall, Pai's Rosehip Bioregenerate Oil is a good all rounder and as it's organic and natural it's unaggressive, so ideal for sensitive skin. This oil can also be used to aid stretch marks, ages spots and UV damage. And it's relatively inexpensive costing £22.00. Are you too obsessed with facial oil?